We recently hung the tv in Our Hutch and it looks even better than before! If you missed the post the first time I posted it here it is! All Things Thrifty had an aaaaamazing Hutch Transformation. I knew after I saw it that I wanted to try it out. So I followed her very helpful and detailed directions and started the search. After a Loooong search for the right Hutch, I found what I was looking for. Little did my hubby know that I had a project for him. I brought the hutch home and knew it would need some work. The hutch had three panels of glass and when I bought it I did not realize that the two side panels did not open….note to self: look over things better before I buy them, we, I mean Kyle, my amazing hubby, took off the doors, and he measured the damaged wood then headed off to Home Depot for some molding for the sides and top of the hutch where the doors use to be. Wood filler was also added in every hole then sanded smooth. I wish I would have taken more before pictures. I failed majorly. These are the only two pictures I have but you kind of get the idea. I used Krylon Irovy spray paint in gloss finish. Then Ralph Lauren Glaze. I used All Things Thrifty Glaze Tutorial , which is very helpful. After I let it dry I sanded areas to finish the look. I then sprayed the hardware oil rubbed bronze. I Looooved how the hutch turned out. 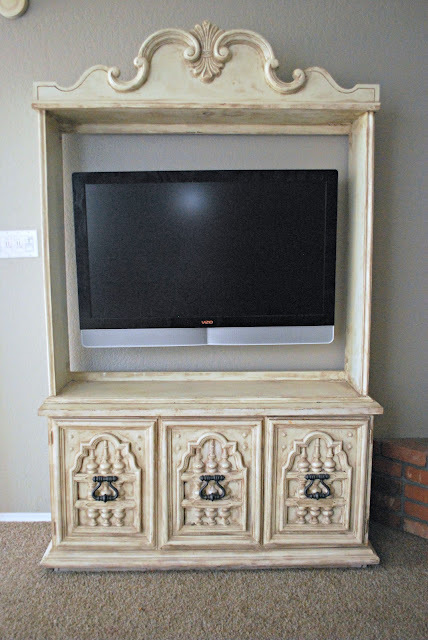 We are planning on mounting the tv on the wall and centering it so it will be in the middle of the upper part of the hutch but the mount that we are wanting to get is not in the budget right now so we will have to have on that for now. Just use your imaginations. Thanks to All Things Thrifty for the great idea. I LOVE my hutch! It is something you can’t buy in a store which is one of the reasons I love it so much! I was easier then I thought it would be! Go find yourself a big new hutch and do the same thing… you won’t regret it! Just make sure the hutch is big enough for your tv! This is a totally awesome work, great to see! So cute! It looks a lot like what I did! My husband is talking about adding a beadboard back to mine so it looks pretty in the corner! Nothing beats turning gawdy 80’s furniture into something beautiful! Such a transformation! Great job! Your home looks lovely and you did a great job on the redo. I just love this!! Looks fabulous!! I turned a china cabinet into an entertainment stand too! It’s the perfect size for most TVs! Good job!